One of the biggest lessons I’ve learned while working for ArtPrize is how much work goes on behind the scenes in order to make this huge event possible. Before I started working for ArtPrize, I never realized how massive of an event it is. There are so many different aspects to ArtPrize that some people probably don’t even realize. For instance, we have our own education program that takes place during the event. Kids from the community can come and learn about art for free! We also have one of the biggest volunteer programs that I have ever seen. Our volunteers are amazing and so dedicated to what they do; ArtPrize really wouldn’t be the same without them. 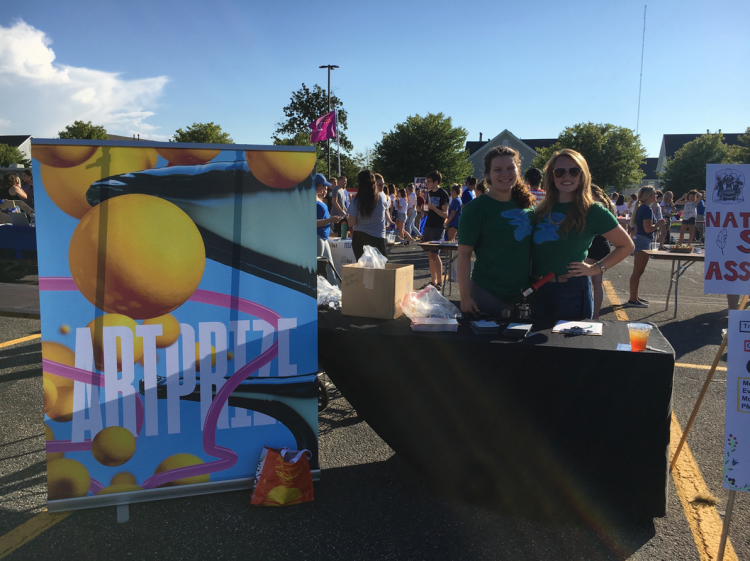 Our lovely Volunteer Program Coordinator, Lauren Froman, travels to different schools and events every week trying to gather even more volunteers to help out with this awesome thing called ArtPrize. Above is a photo of Lauren and I promoting ArtPrize at Grand Valley State University’s Campus Life Night. This is an event where every student organization or group sets up a table and promotes their club or event. Students can learn more about 100+ student orgs! Our volunteer staff works so hard to help make ArtPrize run smoothly and try to ensure that it is fun for everyone involved! Quick shout out to you guys! Another behind the scenes aspect of ArtPrize that people usually don’t think about, is how important print production is to this event, and how important it is that every print piece looks just so. This is where my internship comes into play. As a design intern, I helped produce a lot of the print pieces you see around ArtPrize. The design team worked hard behind the scenes to ensure that the ArtPrize brand standard was upheld. We met with Conduit Studio every week since they are in charge of creating ArtPrize’s brand look for each year. After each piece was designed, then came the printing process. This process was a lot more stressful than the actual design time. If you have every worked with printers, you know how stubborn and unpredictable they can be. One of the more stressful, time consuming and extensive printing projects I was able to witness is the event guide. 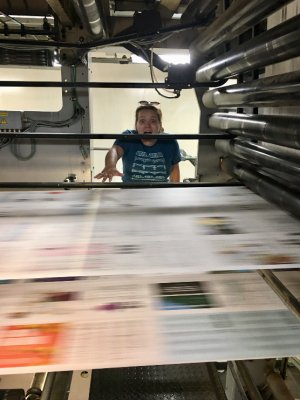 Our lovely design lead, Amy Nieuwsma, spent weeks working on the event guide, and when it was finally time to print, our fingers were all crossed that everything would come out ok. Seeing the print production of the event guide was truly amazing. The facility was massive, and printed hundreds of the event guides every second! Working for ArtPrize was an amazing experience. I learned so much about the organization and have an immense amount of respect for everyone who works there or puts some of their time into the event. I want to thank everyone at ArtPrize for making this such a great experience and I will truly missing working our asses off together as a team.